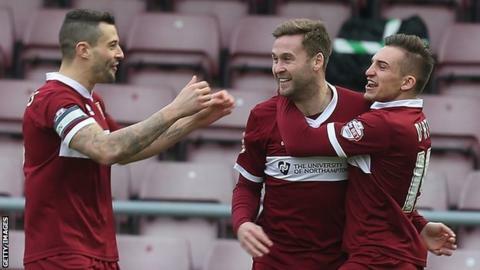 Northampton beat Morecambe to secure a fifth straight League Two victory. The hosts scored after just 26 seconds when Joel Byrom pounced from six yards, after Brendon Maloney's low cross was parried by Andreas Arestidou. Morecambe equalised when Jack Redshaw's effort was saved by Matt Duke, allowing Jamie Devitt to head in off the post. Northampton top scorer Marc Richards then converted Evan Horwood's 54th-minute cross before missing a penalty after Ricky Holmes had been fouled. Morecambe keeper Arestidou dived low to his right to save Richards' 70th-minute penalty. Having moved up to 11th, within five points of the League Two play-offs, Northampton's next two matches are at two struggling sides, 20th-placed Mansfield Town and bottom club Hartlepool. "I don't believe it should have been a struggle for us, but it was, so credit to the opposition for going for it. The supporters were fantastic as always. "Zander Diamond has a problem with his hamstring. It's really disappointing. However, Ben Tozer came on and did a great job. "We've got another big week coming up and hopefully we can keep it going. Hartlepool and Mansfield are fighting for their lives." Match ends, Northampton Town 2, Morecambe 1. Second Half ends, Northampton Town 2, Morecambe 1. Jack Sampson (Morecambe) wins a free kick in the defensive half. Foul by Tom Newey (Northampton Town). Jason Taylor (Northampton Town) is shown the yellow card. Foul by Jason Taylor (Northampton Town). Brendon Moloney (Northampton Town) wins a free kick on the left wing. Substitution, Northampton Town. Tom Newey replaces Ricky Holmes. Substitution, Morecambe. Jack Sampson replaces Andrew Fleming. Attempt missed. Kevin Ellison (Morecambe) left footed shot from outside the box is close, but misses to the left. Attempt missed. Paul Mullin (Morecambe) right footed shot from outside the box misses to the right. Attempt missed. Marc Richards (Northampton Town) right footed shot from a difficult angle on the right misses to the left. Alan Goodall (Morecambe) hits the right post with a left footed shot from outside the box. Alan Goodall (Morecambe) wins a free kick on the left wing. Attempt missed. Ben Tozer (Northampton Town) header from the centre of the box is too high. Corner, Northampton Town. Conceded by Mark Hughes. Attempt missed. Lawson D'Ath (Northampton Town) right footed shot from outside the box is close, but misses to the left. Ben Tozer (Northampton Town) wins a free kick in the attacking half. Corner, Morecambe. Conceded by Lawson D'Ath. Penalty saved! Marc Richards (Northampton Town) fails to capitalise on this great opportunity, right footed shot saved in the bottom right corner. Mark Hughes (Morecambe) is shown the yellow card. Penalty conceded by Mark Hughes (Morecambe) after a foul in the penalty area. Penalty Northampton Town. Ricky Holmes draws a foul in the penalty area. Substitution, Morecambe. Paul Mullin replaces Padraig Amond. Corner, Morecambe. Conceded by Matt Duke. Attempt saved. Jack Redshaw (Morecambe) header from the centre of the box is saved in the centre of the goal. Corner, Morecambe. Conceded by Lee Collins.